Red raspberries are the most familiar kind and are the “standard” type. Yellow raspberries are just variants of the red species. While they are said to have good to excellent fresh-eating taste, they are considered poor for use in cooking. They tend to be lower-yielding than most other kinds of raspberries. Purple raspberries are hybrids of red and black. They are said to be very vigorous and famously yield notably more than either red or black cultivars. Their berries, however, are somewhat “seedier” than red types. Also, the purple fruits have a white bloom that can make the fruit wrongly appear moldy to the uninitiated. 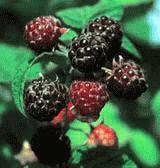 Black raspberries are a different species from red. They typically sucker little and grow in distinct hills or clumps. Their fruit is smaller and seedier than that of red raspberries, though their taste is at least as good. They are slightly more cold-susceptible than the reds and purples. Regardless of color, raspberry cultivars are classified as either summer-bearing or fall-bearing (often misleadingly called “everbearing”). Red and yellow raspberries can be either summer-bearing or fall-bearing, whereas black and purple cultivars are all strictly summer-bearing—producing single crops of fruit that ripen in early to middle summer. Summer-bearing types have biennial canes—in their first year of growth, when they appear, the canes are called “primocanes”, and in their second year, when they actually produce fruit, are called “floricanes” (which die after fruiting). Fall-bearing cultivars actually produce two crops each year: their primocanes develop flowers in middle summer, then bear fruit at their tops in late summer or early fall of the same year (after which the tops of the canes die and are pruned off). But if the rest of the primocane (the portion that did not die back) is left in place, fruit will develop on it in the following summer, at about the same time summer-bearing cultivars are fruiting. (In short: fruit first year, at the top of the cane; fruit in the second year in the middle part of the cane, the former fruit-bearing part having died off and been excised). Because the yield at each fruiting of a fall-bearing type is less than the one-time yield of a summer-bearing type, it is not uncommon for gardeners to cut back fall-bearing types about an inch above the ground in early spring, before new growth starts; that causes the canes to bear only a single crop, in the fall, but a sizeable one. One can then plant both summer-bearing and fall-only-bearing types (fall types treated as described) to get a good harvest twice a year. Climate is important for raspberries. Reds (and, presumably, their kin yellows and purples) prefer cooler summers, but can take winter lows down to -20°; blacks can better stand summer heat, but start to get hurt when lows go below about -5° (though some say 10°). We average about two days a year of -5° or below, and so are more or less safe, but it only takes one wicked cold snap to do the damage, and that can happen any old year. So, the low end of the scale suggests avoiding black raspberries; but how do the other sorts do in heat? We can get pretty warm in our summers—even our average highest high is 90°, and we can get bursts of days a lot hotter. Optimal growing temperatures are around 65° or 70° to 75° F., and if the plant experiences material heat stress, photosynthesis—the process by which plants produce their energy and food—tends to shut down, which of course can result in reduced plant and fruit size, plus possibly a reduction in the amount of food that the plant stores to get through the winter. In particular, most types of primocane-fruiting (fall-bearing) raspberries do not perform well under high temperatures. It is widely reported as delicious—moreover, delicious in two ways: picked while still red, it tastes like a fine specimen of the classic red raspberry, but picked later, when it turns purple, it acquires a deeper, richer, fuller (and apparently distinctive) flavor. It is very productive, with quite large individual berries (technically, they aren’t “berries”, but only a botanist will know or care). It is strongly resistant to most or all of the diseases and pests that can aflict raspberries. It does only minimal and easily controlled suckering. You can read about home gardeners’ experiences with it at various gardening forums on line (here is one such thread). The growing of raspberries is suficiently complicated that we, as nonexperts, recommend that you look to other resources: some good ones appear in the list of links below. But do keep two things in mind: one, raspberry canes tend to have thorns or, worse, spines: wear thick gloves and long sleeves when picking or working on the plants! And two, they make good containewr plants if you have a little space in your home with south window exposure. How to Grow Raspberries - pretty complete. Raspberries are, like such tree fruit as apples, another member of the bountiful Rosaceae family. The classic red raspberry (Rubus idaeus) is, properly speaking, not a berry at all; it is an aggregate fruit of numerous drupelets around a central core. In raspberry and other species of the subgenus Idaeobatus, the drupelets separate from the core when picked, leaving a hollow fruit (whereas with, for example, blackberries, the drupelets stay attached to the core). Fresh raspberries have a very limited period of usefulness, but the fruit freezes very well. Raspberries apparently originated in eastern Asia, where they have been a foodstuff since prehistoric times (though there are also varieties native to the Western Hemisphere, probably carried across the Bering Straight during ancient times). It is said that the raspberry was one of the Eastern foods first noticed by Europeans during the Crusades, when Crusaders even wrote poems about this delightful and—to them—novel fruit. Regular European cultivation begain in the 17th century, and by the 19th century there were almost four dozen named cultivars. In North America, raspberries were an expensive luxury food till about the middle of the 19th century, when they became more commonly grown (and thus less expensive). For a while in the middle twentieth century, raspberries from Scotland—a major grower—were daily transported to London’s famed Covent Garden vegetable mart by a steam train known as the Raspberry Special. It was last modified on Tuesday, 12 February 2019, at 18:37 EST.